Everything old is new again, as we’ve officially entered the age of the hippie 2.0. Out of nowhere, it seems as though this so-called boho style is everywhere, from crop-topped celebs waving their peace signs at Coachella to the pages of our favorite fashion mags touting the resurgence of bell-bottoms. As such, bohemian weddings are hotter than ever, with tons of unconventional décor details – teepees, anyone? – and casually elegant outdoor settings, like converted barns, salty-aired beaches, and tree-lined backyards. Of course, we can’t forget about the fashion. Now that you’ve decided to weave that free-spirited gypsy vibe into your upcoming nuptials and you’ve chosen the perfect candle-lit lanterns and mason jars to complement your theme, it’s time to dress your bridesmaids. Lucky for you, we’ve detailed all you need to know to get your picture-perfect bohemian bridesmaid dresses. Read on for the goods! Layers of floating fabric are the key to boho bridesmaid dressing, so forgo stiff satin, prim taffeta, and sleek silk in favor of flowing chiffon. Take the Bari Jay 1508 dress, for example. From the empire-style waist burst soft gathers of gauzy fabric, which cascade toward the floor in easy, breezy waves as though they’re floating on air. Speaking of effortless movement, jersey knit is another ideal option. The lightweight fabric drapes beautifully to camouflage any problem areas and allows for maximum comfort the whole day through. Opt for a style with flattering ruching and gentle gathers, like the After Six 6697 gown, to add a bit of dimension to the matte material. Nothing screams “casual elegance” like unstructured cuts, so skip the bodycon mermaid styles and ceremonial ball gowns in favor of loose-fitting frocks like the Kennedy Blue Lana, a dreamy floor-length chiffon number with a blousy bodice and romantic A-line skirt. A roomy shift fits the bill as well, as it gently skims the body without hugging too closely to let your ‘maids move with ease. Check out Gather and Gown’s Lynn design, a laid-back above-the-knee style in garden-inspired lace. Speaking of lace, don’t shy away from texture, a welcome addition to any bohemian bridal party. Try mixing materials as showcased by the Kennedy Blue Layla style, which features a surprising lace-wrapped bodice to disrupt the smooth lines of the layered chiffon skirt. Alternately, try a fresh spin on a traditional fabric, like the artfully crinkled chiffon seen on the Bill Levkoff 1138. As an alternative to one-note dresses, choose floral-printed frocks featuring lightly sprinkled buds or blooms that blanket from top to bottom. Mixing and matching is totally an option here as well; dress a few of your ‘maids in prints and the rest in monotone frocks for a surprising – and stunning! – visual effect. While boho-chic often means soft, neutral tones, like ecru and sand, that doesn’t necessarily mean that color is taboo. In fact, incorporating color offers yet another opportunity to mix and match; stick with one shade and blend light and dark hues, or choose a palette to complement your theme, like charmeuse and powder blue for a beachy motif or a mélange of merlot, peach and sage to complement a rustic, woodsy setting. When all is said and done, mismatched dresses are the epitome of effortless chic, so feel free to experiment beyond just colors and prints. Mixing textures and lengths can also deliver an easygoing, don’t-give-a-you-know-what vibe. Special features, such as vine-like embroidered appliqués and nature-inspired rosettes, can add a particularly earthy feel. In the case of this Bari Jay 227, rows of sculpted chiffon blooms cover the halter-like straps and encircle the neck for a garden-inspired bohemian touch. Even on an otherwise structured piece, some thoughtful draping can impart a more relaxed feel, which is, of course, a hallmark of the indie wedding. Try the Dessy 2844, a romantic chiffon number with gently draped off-the-shoulder cap sleeves. Alternately, a thigh-high slit adds a fresh-air-don’t-care vibe to a structured style, with just a flash of skin. Try a style like the Gather and Gown Elizabeth, a relaxed A-line silhouette with a striking Angelina-style slit. For those who lean more sand-and-sun than earth goddess, a halter dress is a great way to impart a beachy aura. Balance the halter’s geometric lines with a flowing A-line skirt that’s perfect for catching the ocean breeze, like the ethereal Dessy 2908. Of course, I’d be remiss to omit the crop top, that ubiquitous staple of festival dressing. Unlike your favorite outdoor music event, however, you’ll want to skip the destroyed denim shorts and pair your bridesmaid separate with a light-as-air A-line skirt. And finally, there’s the high-low dress. Formal meets fun with this on-trend style, perfect for the bride looking to outfit her bridesmaids in something that’s dressy and ladylike without feeling stiff. Of course, no indie style is complete without a few well-placed buds. But while a halo of florals is adorable and all, I think it’s safe to say that we’ve reached peak flower crown thanks to the meteoric rise of festival dressing (although they’d look absolutely precious on your itty bitty flower girls, am I right?). To keep things unique, relocate those rings of buds to your wrists or ankles. As far as hair goes, undone, hassle-free and even slightly unkempt styles are the go-to for the boho bridesmaid. Try loose waves with untouched ends and tons of texture, or a half-up style with a few face-framing tendrils. Weave a tiny plait or two into a free-flowing mane, or throw the whole thing into a perfectly messy, side-swept fishtail braid. Another alternative? Gather locks into an artfully rumpled topknot – flyaways be damned. On the topic of hair, your girls’ effortless ‘dos serve as the perfect palette for – yup, you guessed it – more flowers. Weave a few delicate sprigs of baby’s breath into cascading waves, embellish an updo with a single oversized bloom, or secure a style with an elegant flower comb. Similar to the flower embellishments, a jeweled headpiece with garden-inspired elements like carefully crafted leaves or pristine petals can add an unexpected dash of glamour to those otherwise relaxed bohemian bridesmaid dresses. As for makeup, keep it light and clean. Save the smoky eye and the statement lip for your next girls’ night out, opting instead for dewy, slightly bronzed skin with feathery lashes and barely-there And be sure to stock up on highlighter, because fresh, glowing skin is a must! Heavy bling doesn’t exactly scream “earth princess” now, does it? Skip the sparkling diamonds and colorful gems, and instead outfit your bridal party in piles of bangles, layered chains and delicate midi rings. Alternately, you can skip the jewelry altogether for a true laid-back look. Thankfully for your gals, hippie style means hippie footwear, so feel free to toss the teetering heels aside in favor of gladiator sandals, woven wedges and low-heeled booties. If your setting allows, you may also want to consider no shoes at all, in true flower child fashion. Finish the look with wild bouquets of cascading greenery and lush blooms with accents of surprising succulents and crawling vines. For a true DIY feel, gather your bridesmaids to literally do it yourself, creating one-of-a-kind bouquets, plus a lifetime of memories! 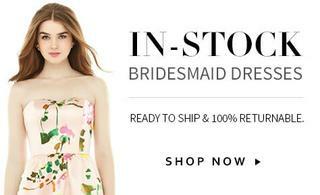 Now you’ve got all the tools that you need to put together a collection of chic bohemian bridesmaid dresses. The style’s main draw is that it’s easy, breezy and way relaxed, so keep that attitude in mind as you begin to shop around with your girls to eliminate any stress and enjoy the experience. Trust me, your ‘maids will thank you!